Creating a startup has a reputation of being an intimidating and exhausting task, but the 80 attendees of Startup Weekend Lexington 2017 proved that theory wrong. With the help of the Awesome Inc staff and support from prestigious coaches, each team was able to create and present their own startups in only 54 hours. Friday night, attendees were buzzing with ideas with the hopes of becoming the next great startup. A game of Half Baked helped attendees’ creativity flow, while easing the anxiety that naturally comes in the startup world. Everyone got the opportunity to network and get into the groove of meeting like-minded individuals in their community. Individuals who came prepared with ideas were given the chance to pitch their ideas to the crowd. Of all of these imaginative ideas, only a select few would be chosen to present their final pitches to the panel of judges at the end of the weekend. After voting, the 11 teams were picked and went straight to work—some camping out at Awesome Inc until 2 a.m. The next morning was filled with donuts, coffee, Red Bull and the adrenaline that comes with any time crunch. From marketing, to development and everything in between, each team spent the entire day figuring out the details of their startups with the help of experienced coaches. The feeling of innovation filled the air as the teams prepped for the pitches that could make or break them. As Sunday approached, teams worked tirelessly to make sure their pitches were perfected. Using pizza as their fuel, the attendees were ready to pitch their brand new startups to a panel of three judges and an anxious audience. Each team showed exemplary team work and persistence, but it was now up to the judges to pick the top three startups to come out of the 54-hour event. Third place was GatherLEX, a team consisting of 8 attendees who wanted to create a new way to socialize with their friends. Similar to the console games like Jackbox, GatherLEX gives groups a chance to play their favorite board games using only their phones. Second place went to team Smart Rotation. Using some of the team’s personal experience with gymnastics gyms, Smart Rotation pitched a new software that automates resource scheduling. Finally, the grand prize winner was announced as Red River Resole. The group consisted of Jay Hamilton, Shelby Jones, Brendan Thompson, Nicole Howley, and Shelby Perkins. Red River Resole brought attention to the fact that Kentucky is home to one of the most popular rock climbing spots in this part of the country, Red River Gorge. Red River Resole would allow climbers to repair their worn down rock climbing shoes for much cheaper than sending them away to be repaired, or just buying a new pair, right here in Kentucky. Howley says they are going to continue practicing repairing climbing shoes so they can perfect their startup and make a difference in their community. Although every team didn’t place as winners, the 80 attendees came away with a greater prize: the opportunity to build long-lasting relationships, learn more about the ins and outs of beginning a startup, and some even walked away with new jobs. Overall, it was another successful Startup Weekend here in the heart of the Bluegrass State. Here are the 11 demo teams and what they are building this weekend at Startup Weekend Lexington 2017. Teams this year are taking part in the Global Startup Weekend, with more than 15k entrepreneurs at 200+ events around the world this week. For a quick recap of the weekend so far, check out pictures on Google Photos and updates on Twitter. Eliminate barriers for exercise by providing all inclusive gym experiences. A distributed ledger of world records built on a blockchain. Team presentations begin at 5pm today at Awesome Inc. Come join us in the audience this evening, enjoy some dinner, and cheer on your favorite teams! TaxSmack Takes the SWLex 2016 Title! All the teams that competed this weekend did an excellent job; congratulations! We had skills and talents ranging from web developers to excellent public speakers and presenters! All our teams stayed fueled with food and caffeine from local sponsors such as Fazoli’s and Cup of Commonwealth. We all had lots of fun this weekend getting to know each other, sharing ideas, and participating in some friendly competition. This year, TaxSmack won first place for Startup Weekend Lex 2016 led by Paul Hamilton and Dave Gilbert! The crowd favorites were Lannister app, a group payment app making group purchases a breeze, as well as Makify! All the teams had such impressive ideas and final pitches that our judges had a tough time deliberating the winner. There were lots of great ideas this weekend and some awesome presentations. The work from this weekend and the ideas pitched serve as an inspiration to us all that even one idea can be made a reality with a little hard work and awesome company! We are so excited to see the success of all the startups from this weekend. More information on all the teams from the weekend can be found here. A big thank you to all our sponsors, organizers, coaches, and judges. It was a great weekend! Here are the 10 demo teams and what they are building this weekend at Startup Weekend Lexington 2016. Teams this year are taking part in the Global Startup Weekend, with more than 15k entrepreneurs at 200+ events around the world this week. For a quick recap of the weekend so far, check out pictures on Flickr and updates on Twitter. Congratulations goes out to all the teams that participated in Startup Weekend Lexington 2015. We had some incredible technical achievements, including virtual-reality software and 3D-printed hardware. We ate some delicious food and stayed well-caffeinated with drinks from Ale8 and Common Grounds. And we had lots of fun, from building paper towers, to pulling all-nighters getting a prototype ready, and making new friends and potential future business partners. Following in the footsteps of SW Louisville, this year’s SW Lex event was won by a team led by Isaac Rowe (aka Nerf), a high school senior. 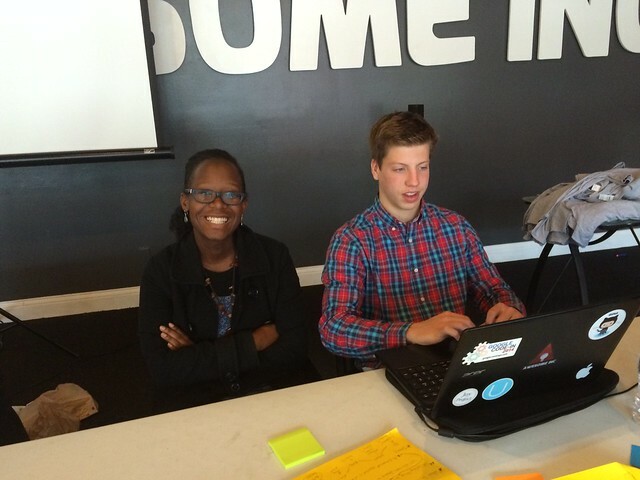 JobTrack’s team includes Monica Leslie and Will Swinton-Ginsberg. These teams scored higher on the judging criteria, which included Customer Validation, Execution / Design, and Business Model. Our top 3 teams will go on to represent SW Lex in the Global Startup Battle – Champions Track. Lapper was also recognized as the community favorite team, while PikaPic received honorable mention from the judges, and VReader was highlighted for its Big Idea and technical achievement. The story of last year’s winner, FinanceU, should serve as a reminder to all our teams of what can grow out of Startup Weekend. Since SW Lex 2014, FinanceU has entered other startup pitch contests, raised over $15k on Kickstarter, and launched a fully-functional product. Here are the 7 demo teams and what they are building this weekend at Startup Weekend Lexington 2015. In addition to competing for some great prizes from our sponsors, the top 3 teams from SWLex will go on to compete against teams from around the world in the Global Startup Battle – Champions Circle. For a quick recap of the weekend so far, check out pictures on Flickr and updates on Twitter. Last week for Early-Bird tickets! So, you survived the mega-Lexington weekend of Breeder’s Cup, Halloween, and UK vs Tennessee football. You’re still getting over the delicious taste of kettle corn and other street food from the downtown festival vendors, and you’re contemplating the void between now and Thanksgiving. What will you do for these empty few weeks of November? Come to Startup Weekend Lexington 2015, of course! This is the last week to snag early-bird tickets, so be sure to register by Friday (Nov. 6) before the price jumps from $50 to $75. This is still a steal for 7 meals and 54 hours of immersive entrepreneurship with your friends. This message brought to you by my favorite early bird, the Wandering Albatross. tl;dr – special SW Lex promo code for women! When you’re the only one of something in the room (as Melissa was the only woman at SW Lou in 2012), it can feel kind of awkward. You may ask yourself questions like, “Am I supposed to be here?” or “Am I good enough for this?”. As Melissa’s team went on to win SW Louisville in 2012, the answers to those questions became quite apparent: the Y chromosome is not the carrier of some magical entrepreneur gene. Melissa has been an outspoken champion for improving diversity of age, gender, and race in Kentucky’s startup communities ever since. With this article she highlights that while times are changing, the EHoF’s recognition of historical achievements noticeably lags behind the present. So, how about some self-assessment on diversity in our Kentucky startup scene? If we use EHoF inductees as a dataset, we’re not as bad at diversity as local university presidents. But it does seem odd that for a state with demographics of 50.8% women, we only have 4% women in the EHoF (25% for Emerging Entrepreneurs, a more current category). Our numbers aren’t quite as far off when it comes to people of color, as Kentucky is only 12% non-white and EHoF inductees are 4% non-white (10% for Emerging Entrepreneurs). Since it takes a while to grow a large company (and to make a cultural change), we don’t expect any sudden changes in these demographic numbers for Hall of Fame inductees, but we do expect the Emerging Entrepreneurs category (showcasing success-in-progress) to more accurately reflect the diversity of Kentucky’s population. The Kentucky Entrepreneur Hall of Fame states that, “Our mission is to raise awareness of the impact that entrepreneurship has made in the Commonwealth and encourage others to pursue similar ambitious endeavors.” I think it’s doing a good job with Part 1, showcasing that successful entrepreneurs are not all from California or New York, but are Kentuckians just like all of us. Yet for Part 2 of the mission statement, Melissa’s note reminds us that people are often more inspired by stories similar to their own. I’m more inspired by Ralph G. Anderson, a UK Engineering grad like myself, than by Mark Zuckerberg (who kinda went to Harvard for a while). We can’t change Kentucky’s past, but we can change our future. To help do this in one small way, we’re offering a special scholarship rate to women for Startup Weekend Lexington 2015. Enter promo code women2 to save 50% off registration, and bring your crazy startup ideas, exquisite design sense, and elite hacker skills with you for the Nov. 20th – 22nd event! The winner of Startup Weekend Lexington 2014, FinanceU, was recently awarded 2nd runner up in the Education, Empowered track for the Global Startup Battle. With over 25,000 global participants during the weeklong November event, we couldn’t be more proud of our local teams! Check out the UP Global blog for more information on FinanceU and all the GSB winning teams. Good luck to all our teams as they continue to compete in the Global Startup Battle and grow their businesses beyond this weekend. As an example of what is possible, it was great to have Daniel Johnsen, founder of 2013 SW Lex winner Recovery Station, back as a judge this year. Daniel has continued working on Recovery Station over the past year, gaining a spot in the Velocity startup accelerator program and winning $20k from the Vogt Awards. What will you do by this time next year? We hope you go BIG!